A Unity of Purpose -- This exhibit documents the rich history of physical therapy education at Boston-Bouvé College.. Improving Bodies, Minds and Spirits: 150 Years of the Huntington Avenue Y -- This exhibit is the result of a University-wide collaboration to document the history of the Huntington Avenue YMCA. The Children's Art Centre -- This exhibit is an introduction to the Children’s Art Centre located in Boston’s South End. 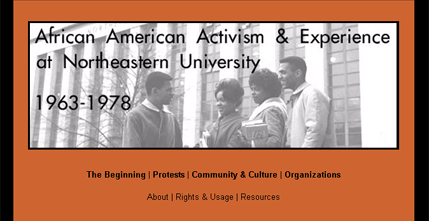 African American Activism & Experience at Northeastern University -- This exhibit was a joint project of the Department of African-American Studies and the Archives to document Northeastern's African American student culture and activism.